It’s All About the Music: Everything in the life of Gordon Bowie revolved about the music that he performed, conducted, composed, taught or examined for copyright. From the podium at the head of the 70-piece Montgomery Village Community Band, Gordon reminded his players weekly that it was the music that mattered. He taught them to love and appreciate how they could come together to make music that was greater than the efforts of any one of them. He taught his audiences to appreciate what they were hearing. It was all about the music. Gordon W. Bowie, Ph.D, conductor, composer and musician, died January 5, 2012 at the age of 67 after a long fight against prostate cancer. For the last twelve years, he was conductor of the Montgomery Village Community Band in Montgomery Village, MD; before that he was conductor of the Bangor (Maine) Band, a semi-professional band in the old New England Town Band tradition. His own instrument was the Bass Trombone, which he played in the Bangor (Maine) Symphony Orchestra for 32 years before moving to Washington, DC in 1997, where he continued to play with Virginia Grand Military Band, National Concert Band of America, and Legacy Brass Quintet. Under Dr. Bowie’s baton, the Montgomery Village Community Band greatly expanded its repertoire and enhanced its reputation. The band has been invited to perform at numerous venues, including the 25th anniversary celebration at the Leisure World complex in Silver Spring, MD. The band also recorded the World War I era march “Let’s Go” for inclusion on the compact disc “Remembering Carlisle Barracks: A Musical and Pictorial Journey”, which was released in 2008. In May, 2008, the Montgomery Village Community Band hosted a successful Maryland Community Band Day, in which eight community bands from across the state of Maryland came together for a day of excellent performances. 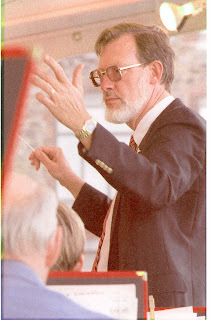 Dr. Bowie was the composer of several marches for band, including Carlisle, a commission for the U.S. Army War College in Carlisle, PA; many pieces for brass quartet and quintet; and a concerto for the ancient instrument known as a Serpent, which was commissioned and premiered by Douglas Yeo, recently retired bass trombonist for the Boston Symphony Orchestra. His march USS Maine was commissioned for the christening of the Trident submarine SSBN-741, a United States Ohio class nuclear submarine launched in the mid-1990’s. Early in the first decade of the 21st Century, Gordon Bowie became Copyright Examiner in the Performing Arts division of the U.S. Copyright Office in the Library of Congress. There he put his extensive knowledge of musicology to use in examining new music submitted for copyright protection. He continued working for the Copyright Office until the week that he died. Born just outside New York City, Gordon Wingate Bowie spent his early childhood in Greenwich Village with his artist mother and newspaperwoman grandmother. Gradually the family moved first to the near suburbs of Long Island and eventually to Brightwaters, NY, farther out on Long Island’s south shore. Teenage summers visiting his grandparents in Maine attracted him to that state, where he settled after graduating as a music major from Colby College in Waterville, ME. Following a graduate degree in music education from the University of Colorado he moved back to Maine and spent the years until 1997 immersed in that state’s music scene: teaching at every level from K-12 to college; playing trombone in the symphony and brass ensembles as well as bass guitar in dance bands and jazz bands; and teaching a private studio on every conceivable instrument—all of which he could perform well enough to demonstrate proper technique to students. He was an accomplished harmonica player as well. In 1993 he received his Ph.D. in music from the University of Maine. For most of his years in Washington, Gordon Bowie lived in Foggy Bottom. In 2009, when his illness precipitated a move to a single-story dwelling, he and his wife moved to an apartment in Crystal City, VA, where they could view the city skyline and actually see the Library of Congress building where he worked. He is survived by his mother, Gail Story Opp, of Asheville, NC; a son and daughter-in-law, Gavin W. and Sarah Mars Bowie of the District; and his wife of 46 years, Mary Bowie, of Crystal City.